1.) 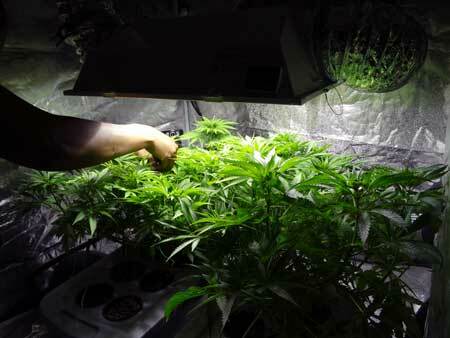 Increase Amount of Light - You need light to power the growth of buds. If you've got weak grow lights, that could be the limiting factor preventing you from getting better yields. If you've already got very strong lights and have mastered all these other techniques, it may help your yields to start adding CO2. 2.) Train Plants to Grow Flat Like a Table (Indoors) - This free way to produce more bud indoors involves training your plants in the vegetative stage to grow more flat, like a table. 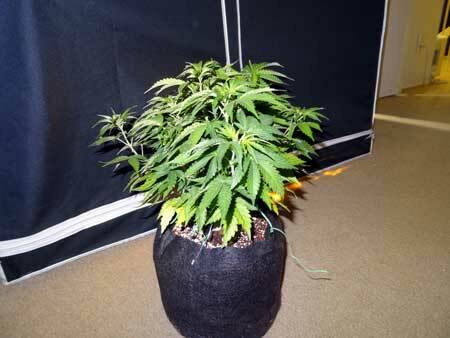 This creates plants that have many bud sites near the top of the plant. 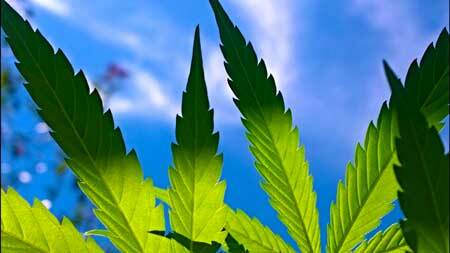 Marijuana plant puts the most energy into buds that are A.) near the top of the plant, B.) have direct exposure to light and C.) have access to plenty of airflow. The more buds you can make at the top of the plant with direct light and good airflow around them, the better your yields will be under indoor grow lights! 3.) Provide Correct Nutrients - Nearly any standard nutrients will work in the vegetative stage. 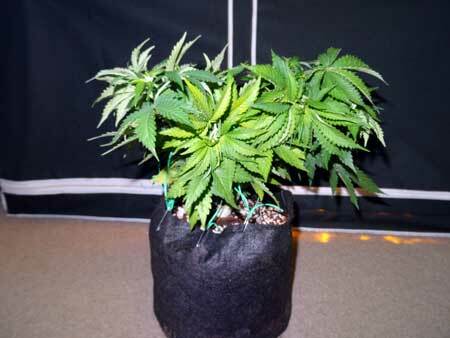 Marijuana plants really do grow just like weeds in the vegetative stage! However, in the flowering stage they should be using nutrients specially made for bloom. Flowering nutrients are low in Nitrogen (N) but high in Phosphorus(P) and Potassium(K). Sometimes less is more, especially in the flowering stage! Too much Nitrogen when buds are forming can inhibit bud growth, and too much nutrients overall in the flowering can leave a "harsh" flavor to buds. Learn more about which nutrients work! In addition to using the right nutrients, there are some growing supplements which may help increase yields as well, though which supplements work as intended is a topic that's hotly debated! 4.) Control Growing Environment - If you create a good growing environment, you're making your environment work for you instead of against you. Simple things like reflective walls and a strong exhaust fan can make a huge difference in your grow. If you are looking for 1-5 ounces a month and want a "done-for-you" growing environment, you might consider getting a grow tent because they are made specifically for growing plants like marijuana! 5.) Harvest Plants Properly - If you harvest at the right time you'll get the best yields possible. Most importantly, don't harvest early! Your marijuana buds will fatten up significantly in the last two weeks before harvest time, and if you harvest early you'll be losing out on that! Plus waiting until buds are mature means you're getting the top potency! 6.) Choose a High-Yielding Strain - Genetics has a major effect on yields! You could grow two plants in the exact same setup, and one can produce twice as much as the other! You can optimize mother nature, but a plant can't produce more than its genes will let it. If you don't want to start with random seeds you find (bagseed), luckily you can order seeds online! If you choose to get feminized seeds it means every single plant will be female and make buds (so you don't have to worry about identifying males and removing them). What technique do you use to increase yields? 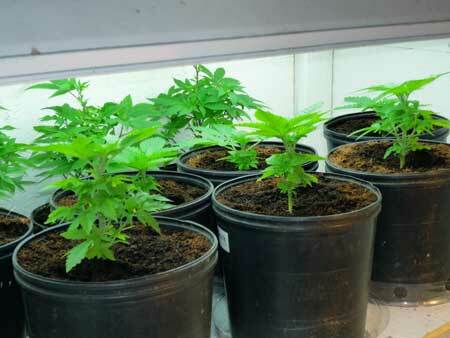 In 2# you state that "the shorter the plant, the bigger the yield". Let me say how i think then PLEASE correct me if I'm wrong. Because our artificial lights have a very short penetration; invers squar low- and because plants can't handle too much light and low level of light intensity means no buds can form so there is a limited space under the lights that gets perfect intensity; Sweet spot. I did read in here that Sirius was talking about flowering stretch. somewhere else in GWE i read that plant stop growing vegetativly at the second half of flowering stage, means no leaves and stem growth at all. 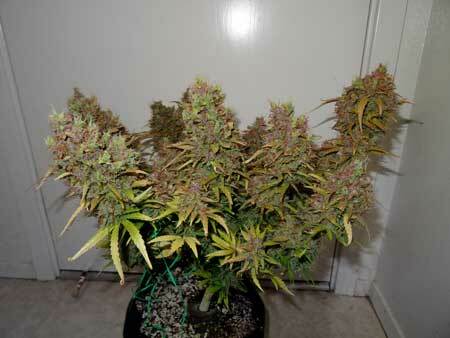 Plants stretch fast in a short period of time before start making buds. Forming buds happens after Stretching. If stretching is a preparation of forming buds why should i train them to stay short? I train them because our light cant penetrate enough. Plants compatibility with sun(sun's great penetration is against our low penetrative lights) force us to train them stay short. Plants need planty of lights to develop their buds. And great level of light is in the sweet spot so i think a light with higher penetration has a bigger sweet spot area and should have bigger yield than a light that doesn't. Penetration depends on the type of reflectors not the bulbs. I think the penetration of 5w with primary lens LEDs is much better than 3w LEDs and i can have bigger sweet spot with 5w LEDs. Thell me 13 band spec UVA-NIR of SM800 encourages the grils to grow faster (Emerson Effect) than HPS with no NIR wavelengths(how can it possible, many heat and still no IR!! Last edited by Iammygod; 09-20-2016, 12:32 AM. I think I was a little unclear and I updated the title name of #2 from "Train Plants to Grow Short & Flat (Indoors)" to now it says "Train Plants to Grow Flat Like a Table (Indoors)"
It's not actually about being short as much as being flat. 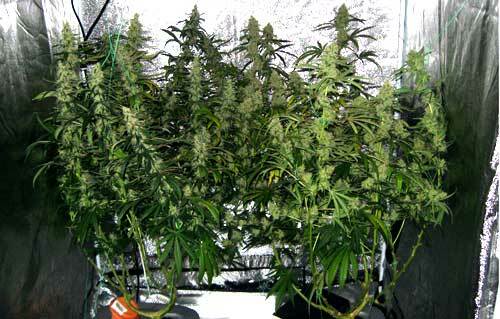 In fact, bigger plants produce bigger yields because they have longer buds. If you have a 2 inch bud and a 5 inch bud of the same density, the longer one will weigh more. Bigger lights have deeper penetration, which means they can reach further down into the plant and support longer colas. CFLs can support colas that are just a few inches long, while big HPS lights can support colas that are a foot long. My main point is that indoors it's better to have a wide, flat canopy as opposed to one that grows in the natural Christmas tree shape. Outdoors the natural shape of the plant is actually pretty effective because the plant gets light from all sides as the sun moves in the sky, but indoors a flat canopy takes better advantage of your grow lights. Buds have access to bright direct light - You can see this indoors because the buds directly under the light get bigger than the ones around the edges (which are otherwise the same but get less light overall). Also, outdoors if you have a plant next to a wall or fence, the buds on the wall side don't get as big as the buds on the sun side. 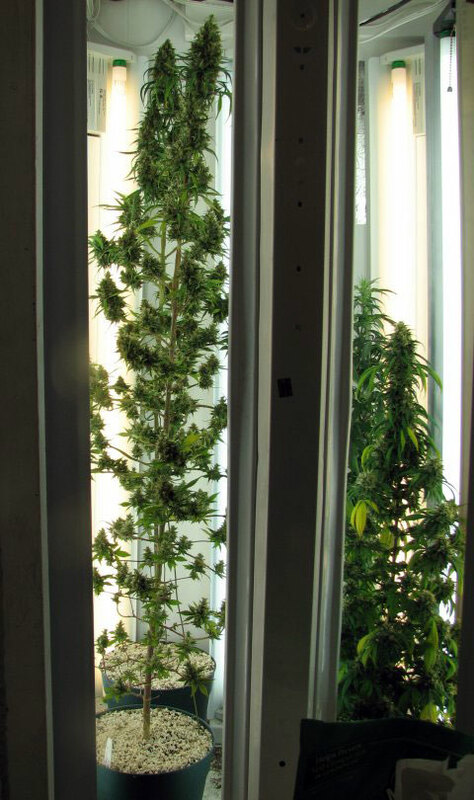 Buds have access to air and a breeze - each cola should have a few inches of space to itself to fatten the most. Defoliation techniques have shown that buds exposed to bright, direct light and a breeze fatten more than if a bud is hidden and doesn't get access to light and air circulation. Plus, if there's too many buds close together they steal from each other and don't get very long during the flowering stretch, so you end up with lots of short little buds instead of long, thick ones. These conditions produce the biggest yields overall. So that's why it's recommended to train the plant to grow flat and wide in the vegetative stage. You're setting the stage to create these conditions. Here's some examples of those conditions being created different ways. They're all different ways to achieve the same ends. While reflectors do have a big effect on penetration, the bulbs have just as much, if not more of an effect. No matter what type of reflector you use, you could never get a CFL to penetrate as deeply as an HPS. You will never find a plant with dense foot-long colas that got all the light only from the top of the plant from CFLs, even if they have reflectors. When it comes to LEDs, the reflectors/lenses do make a big difference. Since each LED diode is not a complete light source (you can't grow the plant healthfully under just one spectrum of light, it needs a mix of blue, red and green for the healthiest growth), you not only care about penetration, you also care about making sure the light from each diode gets "mixed together" before it reaches your plants so each leaf gets closer to a full spectrum of light. So it becomes a matter of finding that balance between a wider angle and a deeper penetration. When it comes to LED vs HPS, it's a matter of what you're looking for. HPS lights will yield slightly more per watt, but you've mentioned that electricity cost isn't really a concern for you. When it comes to cooling, the small LEDs will pretty much keep themselves cool, and that can be perfect if that's the size grow you're looking for. But once you start getting into the bigger sizes (above 250W of electricity out of the wall) they start getting really hot and also need to be cooled just like any other light. When it comes to the bigger lights, it's far easier to cool a big 600W HPS than a similar wattage LED because HPS lights are sold with air-cooled hoods which are designed to making it easy to cool with an exhaust fan and ducting. LEDs on the other hand can't be air-cooled so you just try to cool the grow space they're in. We have an Advanced Platinum P900 LED and even though it only uses 557W out of the wall, the grow tent is several degrees hotter with the LED on than with our 600W HPS where the air-cooled hood can be connected directly to our exhaust fan. LEDs are perfect for that in-between size between CFLs and an HPS. LEDs are designed with heatsinks and fans to prevent heat from beaming down onto the plants, so they help keep plants cooler compared to a naked HPS bulb that's a similar wattage. But once you get to the 250W or 400W size, it's going to be a lot easier to keep things cool with an HPS as long as you're willing to get a real exhaust fan and vent extra heat outside using ducting. The big LEDs just aren't designed to be attached to ducting, so more of that heat stays in the tent instead of being vented directly outside. In the end, it depends on what you're looking for, but I think LEDs are perfect if you're looking for a harvest in the 2-4 oz range. Anyways, I hope that answered all your questions! There are different ways to go about it, some people prefer to take just the very tip when the seedling has 4-5 nodes, which doesn't usually stunt the plant if you only take off a tiny bit. Some growers wait until the plant has grown 6 nodes, then cut back to the 3rd. This allows them to have a really low "base" but prevents the plant from being stunted. I'm sorry you've been having trouble posting in the forum! Let's try to get this figured out! As far as posting a new topic, what happens when you go here? If it's not working, could you possibly try it in a different browser to see if that works for you? For example, if you're using Safari, could you try that link using Chrome or Firefox (after logging in to the forum)? As a Platinum LED user myself I agree with you on it being much harder to cool LED's and having to cool the room instead of the lights themselves, in all the discussions on LED lighting nobody ever brings up these important points as to how the heat saturates the room differently or how you have to change your idea of how you are going to exhaust or deal with the heat differently between different light set ups. I am also very appreciative of your explanations of why and how the buds grow differently depending on whether you grow inside or outside... to often it takes people years to figure this out, if and when they do. It is always such a pleasure to read your explanations and work on things because you explain it in ways that you cover it from every angle to ensure someone gets it. You truly are a great writer and it is always a pleasure to read your writings and be able to send others to come read it so they will finally understand things better as well. I know CFLs emit about 60 lumen/watt and HPS about 150 lumen/watt. Here, we are talking about penetration so light spec is not getting into the discussion. I think an 1.0x watt HPS and a 2.5x watt CFL with the same reflector should have the same lux in the same distance(level) which means they have the same penetration. But you say they dont. Tell me why. principle of superposition of waves? If two light sources emit the same number of photons(same lumen here) with the same reflector, they have to have the same lux in any levels. If dont, where is the energy were carring by photons? If CFLs don't penetrate like HPS with the same reflectors so maybe someone is getting CFLs photons in between of their ways. I have read in your articles that CFLs produce 0.25 gram/watt and HPS produce about 0.5 gram/watt. Its understandable for me because HPSs produce around 2 times more light than CFLs when the watt is the same. Im looking for 3kg(7lb) harvest. Base on my research LEDs are 50 percent more efficient that HPSs so two 600w HPS system can be replaced by one PM800. All light emitting technologies produce the same heat per watt(3.41 BTU/Hw) and I know its true for sure. I know PAR is not the best parameter to measure spec quality because different Photons have different values for plants but PAR definition applies the same value for each photons. As i said before my electricity rate is extremely low so the lower power is not something i need to pay attention to. Is our technology about LED grow lights have reached where we can say that LEDs have more spec quality that HPSs? Are Black Dog LEDs able to satisfy their claims? Do i think correctly that 5wat LEDs with primary lense in good LED panels penetrate much better than HPSs? If not tell me the reason please. A 600 HPS light systems is around 200$ but i have to pay 500$ for every shipments of them. Now PM800 is 2300$ and im able to deliver it with 2700$. LEDs long lifespan can make them great choice for me specifically if they have better spec quality and better penetration. In this circumstances is it good choice for me to buy 4 PM800(or even PM1000) to cover 9'×9' gorilla grow tent? Im still looking for all my questions answer even if you give me simple YES/NO answer to buy PhytoMax. Last edited by Iammygod; 09-21-2016, 02:49 PM. Lux is a measurement only used to determine perceived brightness by the human eye. Lux has no place in determining light efficacy for plants. IMO, you're looking too much into the numbers here. I understand you're reason for wanting to understand the theories and mechanisms behind all of this but at some point, practical application has to be considered as well. I'd take the pepsi challenge on your claim that your SM800 (which i googled but can't find anything about it...) is equivalent to two 600w HPS's. LED is the future. No debating that. If you can afford the up front costs of an LED right now, more power to you (actually less, due to LED efficiency, right?). I will stick with my 600w HPS system, which i paid $200 for. Ops... I meant PM800 not SM800. You're right, there is no SM800. PM means PhytoMax, by Black Dog Co. I think this is where you're getting confused. LEDs don't beat HPS yields watt for watt, at least not on average, and not with the current technology. 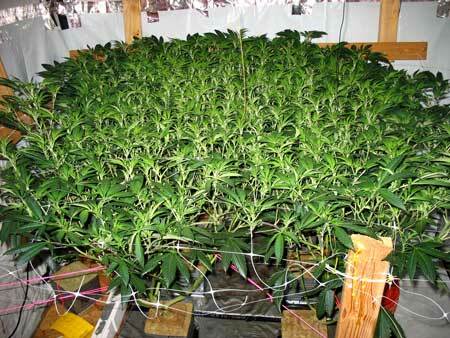 HPS lights get the same or higher yields for the amount of electricity used. We've run this site for years with growers writing in about their experiences with LEDs, and we've grown with LEDs and HPS ourselves. We've gone to grow conferences and talked with LED manufacturers and even they'll tell you the same thing when you're talking to them as a professional grower face to face. LEDs may use less electricity than the lights they're supposed to replace, but they also produce less. Just to give you an example, a 600W HPS light can produce 1 or even 2 pounds by itself if you set it up right. I have yet to see (by someone actually documenting their grow and not selling LEDs) an LED ever consistently beat that yield out of that wattage. But I'd love for you to to prove me wrong so I could put the grow journal on the website! Maybe it's happened once or twice with a really good grower and lots of LEDs spread out over the room, but I think you'll be hard pressed to find a single grow journal that achieves that without supplementing with extra light. If you want to get LEDs, you should! It's most important to get a grow setup that excites you and LEDs have a lot to offer, but they're not magical. I believe the best way to learn is to try it for yourself. I know the forum would love to hear about your experiences and see your pics! LST to increase number of colas. Wow, that's a really great picture! It really shows what the base of a plant looks like after you remove the top when it's young. How many colas did you end up with? I am in week 2 of light switch and have around 17 bud sites from one plant. I removed some that weren't going to make it to the top canopy and have one or two that I am giving a little more time to see if they will make it to the top. Will that be too late to remove any stragglers? You're getting close to the end point, but I think you could still pull one or two now I feel your struggle! On the one hand you know you want as many colas as possible, but on the other hand you want to make sure you're nurturing the best ones so your plant isn't wasting energy on ones that won't produce anyway. It sounds like you're on top of it, though! Maybe post a picture of the plant in the setup? Here she is... I have thinned out 3 times already but it just keeps filling in strong! You need to invite Green over for a couple minutes in there! LOL Awesome looking!